Your most trusted dentist in the O'Fallon area for dental crowns is Dr. Schwarz of Riverheart Family Dentistry. Our practice treats patients of all ages in restorative, cosmetic and general dentistry. When it comes to restoring a tooth from damage or decay, you can depend on Dr. Schwarz to offer the most durable, functional and aesthetically pleasing solution. Regardless of why you need a cosmetic crown, you can trust that we will make your procedure as comfortable and convenient as possible. Our practice adopts the latest in dental crown technology to minimize your office visits and ensure a more precise and comfortable fit. We also offer options in sedation dentistry for patients who want a truly relaxed experience in the dental chair. 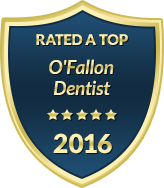 Contact our office today to schedule your appointment for a beautiful custom crown in O'Fallon. We proudly serve patients from pediatrics to geriatrics with the patient-centered care they deserve. To make your crown more affordable, please ask a member of our office staff about our flexible payment options and financing plans. Let us restore your smile the way you deserve at Riverheart Family Dentistry.